We're here. 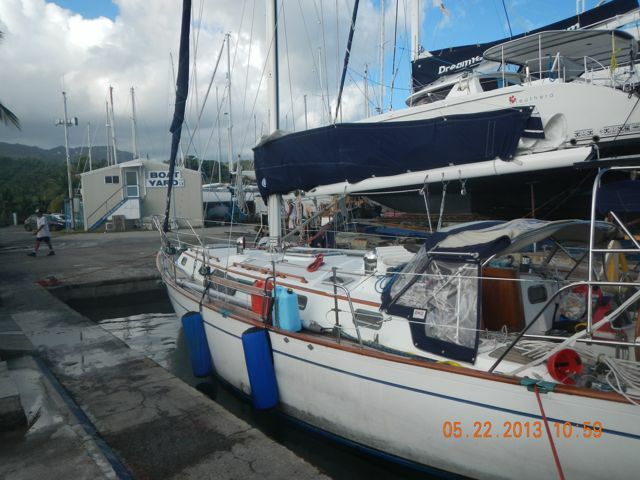 We're in Raiatea, an overnight sail from Tahiti. This is the official end of the trip. We leave Wings here on the hard and return to our lives in Alaska. It's hard to fathom and even harder to live. 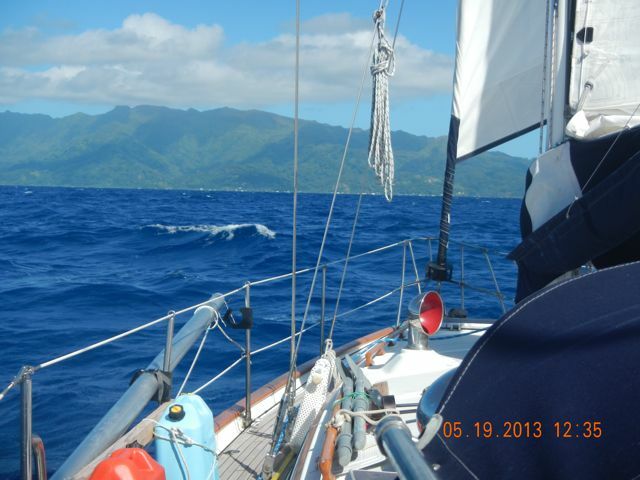 We left Papeete, Tahiti, and enjoyed an uneventful and exhilarating all-night sail to Raiatea. 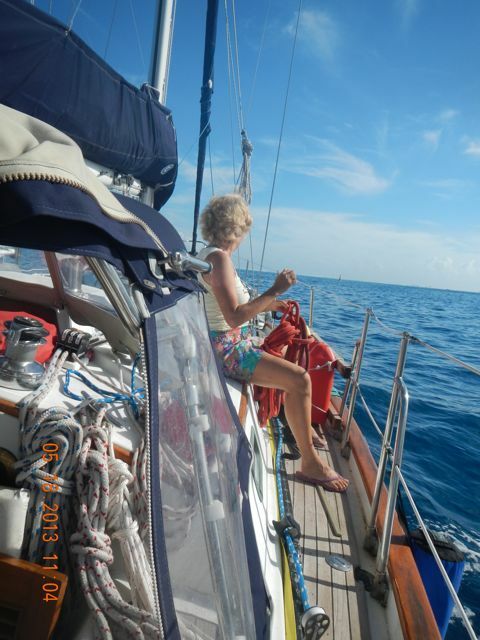 We stayed at anchor for two nights until we were lifted from the water and stored on the hard. 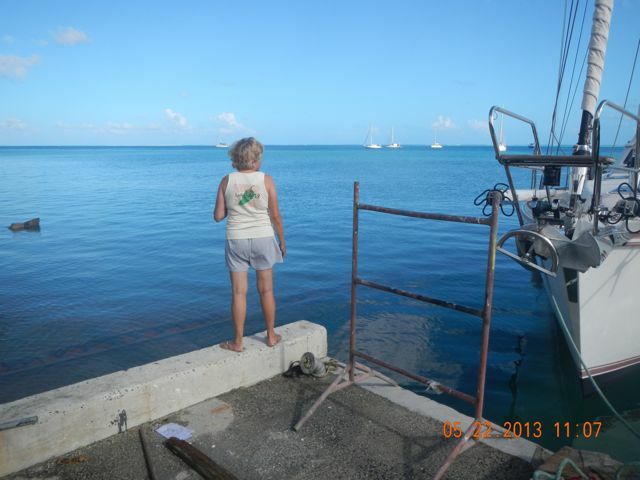 After 1-1/2 days of effort, we left Raiatea until Spring (their Fall), 2014. 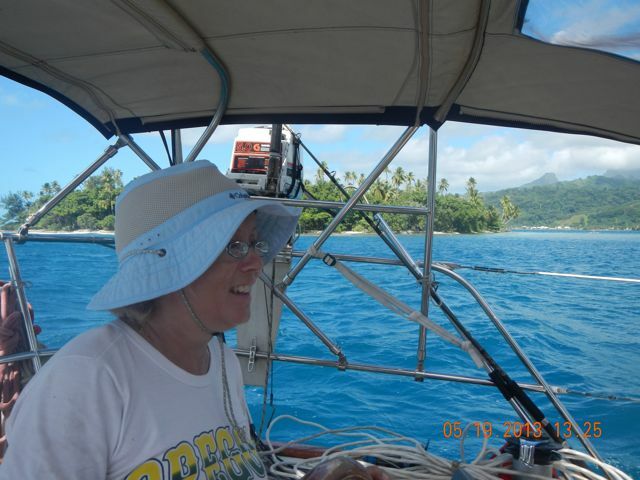 Lovely Conni enjoys the sail along the reefs at Tahiti. Moorea as seen from our anchorage in Marina Taina, Papeete, Tahiti. 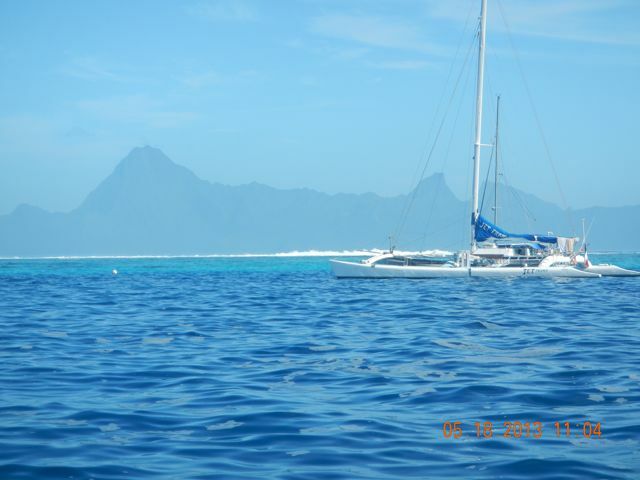 The Pacific beats constantly on Tahiti's reefs. A million years hasn't broken the reefs. 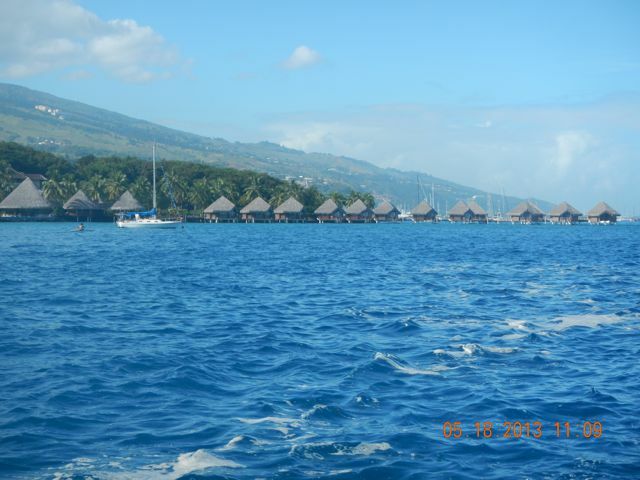 As we leave Tahiti, we pass the typical cabins built out over the water. 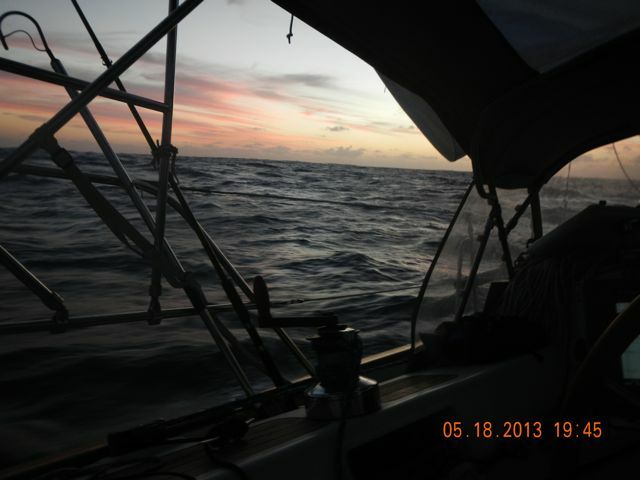 Our night sail to Raiatea, just the two of us, was uneventful but a great sail with good wind the entire way. 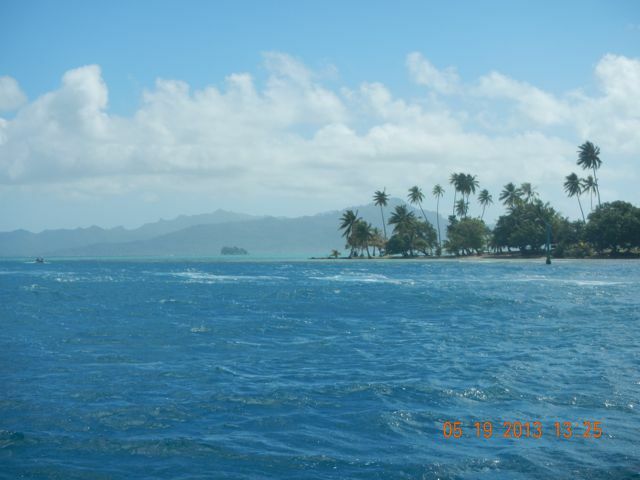 Raiatea! Its reef contains both Raiatea and Taha'a. You can see the split in the two islands. 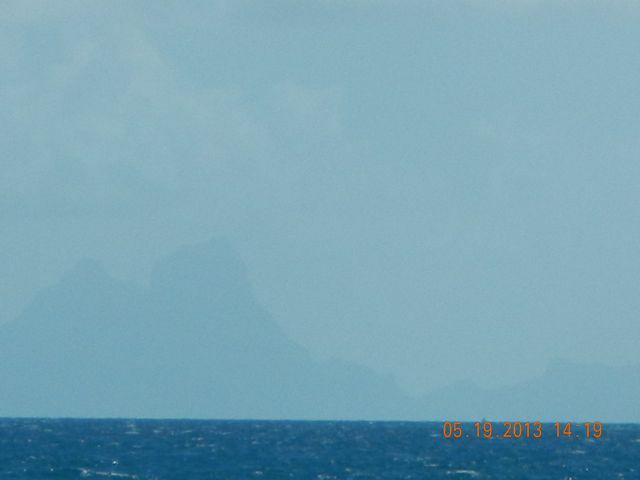 Raiatea is at left. Green, green Raiatea is a jewel in the Pacific. By far the most beautiful entrance we've enjoyed, Raiatea has these two gorgeous motus at the entrance. 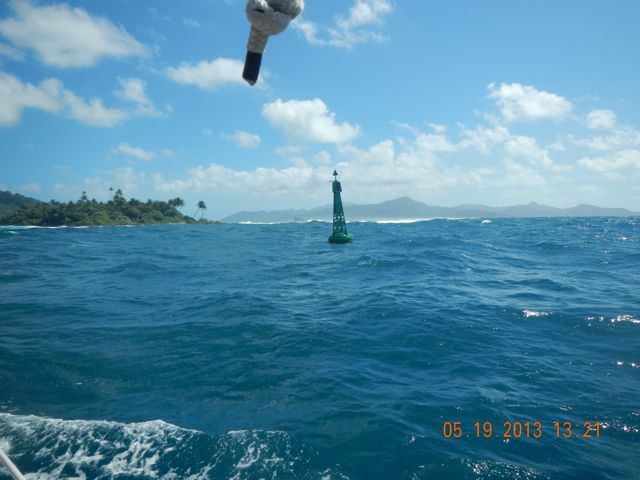 Notice the huge surf breaking on the reef. 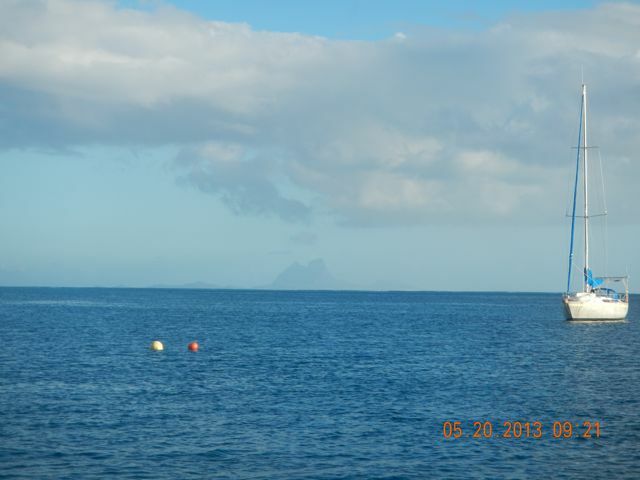 The island in the distance is Taha'a, sharing the same reef. The northern motu is stereotypic of the South Pacific. This is the southern motu. Beautiful! Her smile says it all. 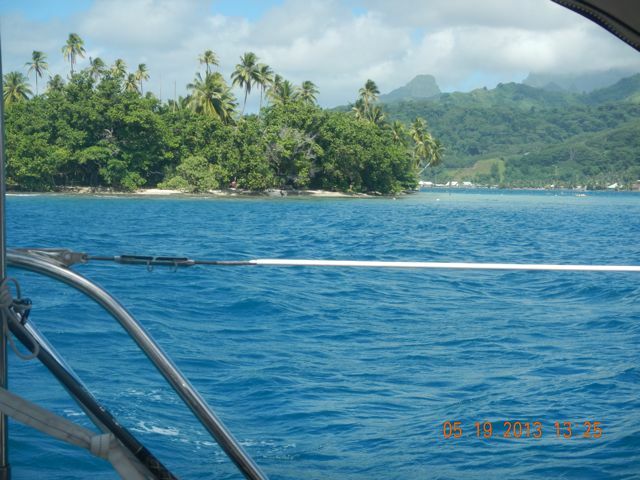 Conni takes the helm and guides us into Raiatea! Bora Bora looms in the distance. Only 6 nm away, its silhouette is unmistakable. 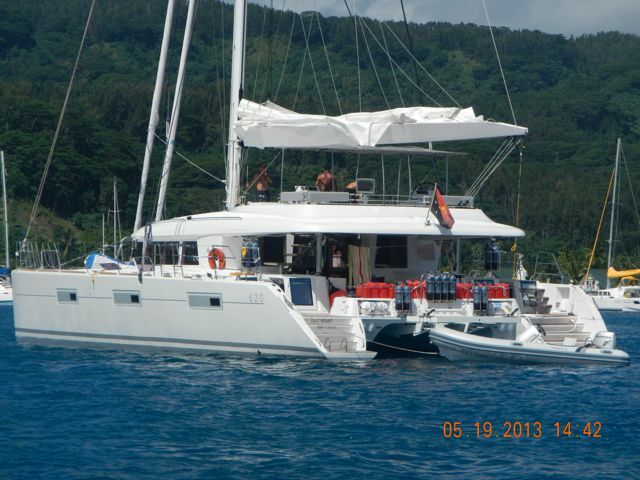 SCUBA tanks and gasoline tanks cover the stern of this huge catamaran. 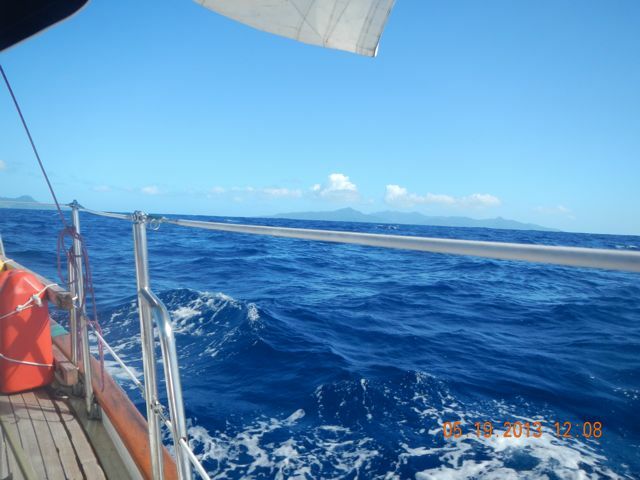 Bora Bora in the background, we lie at anchor in Raiatea with this scene to view. 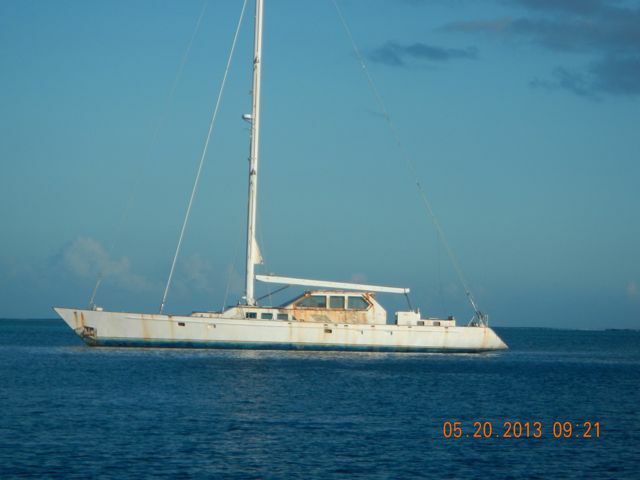 This beautiful steel sloop sank at Bora Bora and was raised and sold to a Canadian. He returned to Canada to earn money for repair, we were told. I think that she's a lovely boat, even damaged. What gorgeous lines! Wings in the slip, prepared to be lifted. Lovely Conni watches the horizon as we await Wings' lift. The boat to her right is an Amel, a French-made yacht. They're very expensive and well-constructed yachts. We've seen more in French Polynesia than anywhere. The TraveLift moves toward Wings. 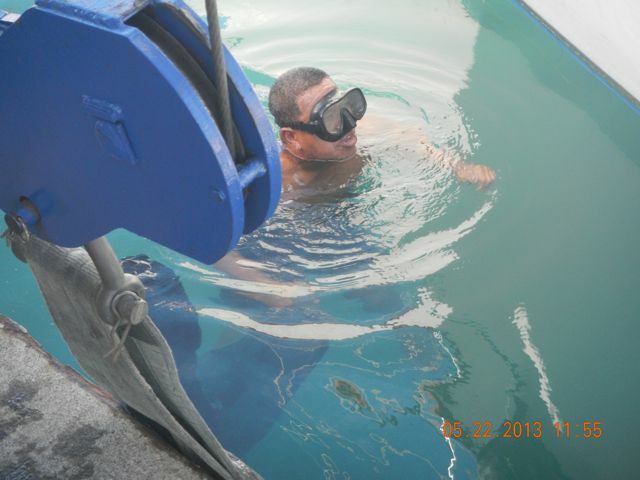 To prepare for the lift, the lift driver dives on the boat to ensure that the slings (at left), do no damage in their positions. Conni watches as Wings takes to the air. What a lovely hull! Taha'a is in the distance at right. 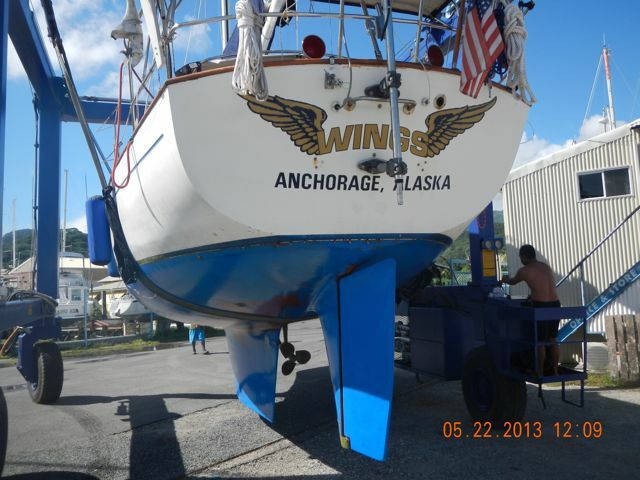 One of a kind here in Raiatea, Wings is moved toward her cradle. If you look closely at her port bottom, you can see where I ran out of blue paint in La Paz and her previous red hull color is exposed. 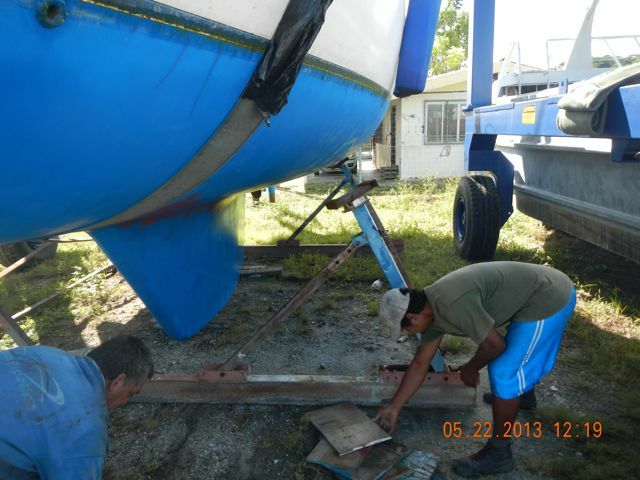 The yard crew works to block her hull. Wings' keel rests on blocks on the ground and the hull is supported vertically by the adjustable arms. 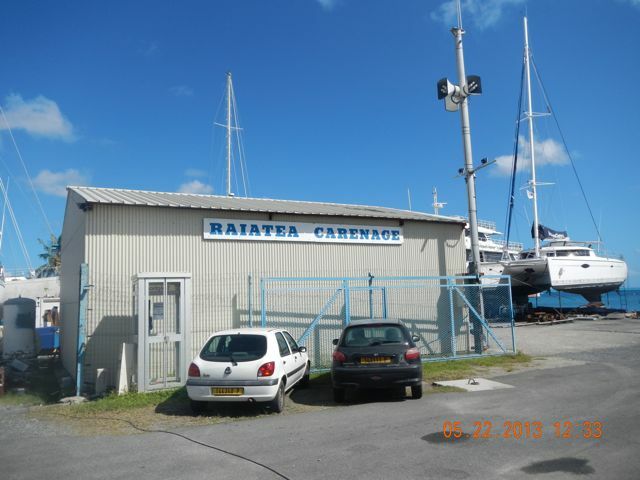 The Raiatea Carenage office. 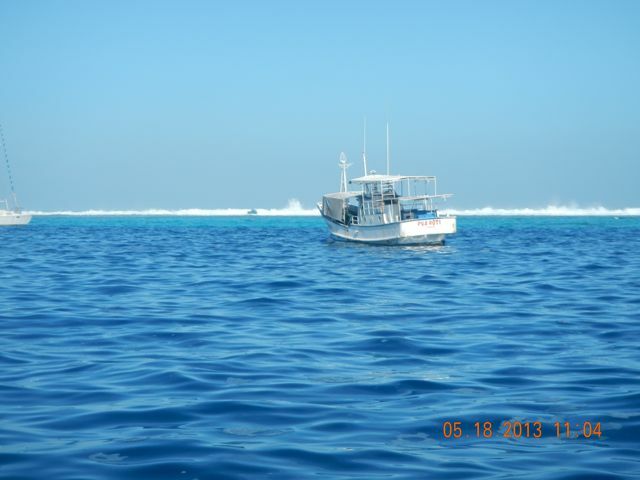 The big catamaran at right we saw on Rangiroa. Lovely Conni watches our position as Wings is leveled on the cradle. 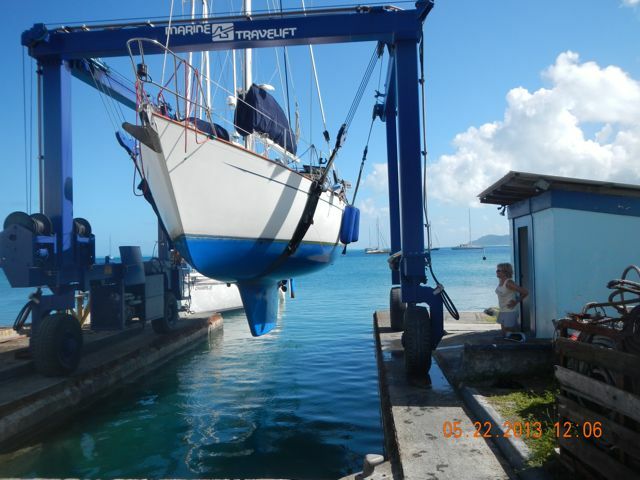 The crew leveled the boat twice to make us happy. 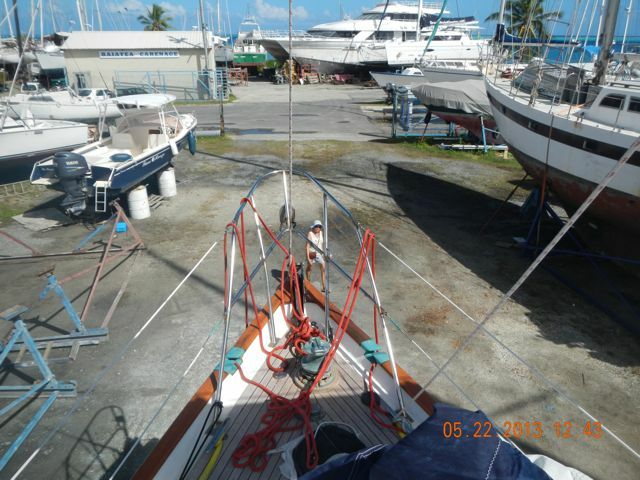 Note the halyard connected to the bow fixture and not a forestay. 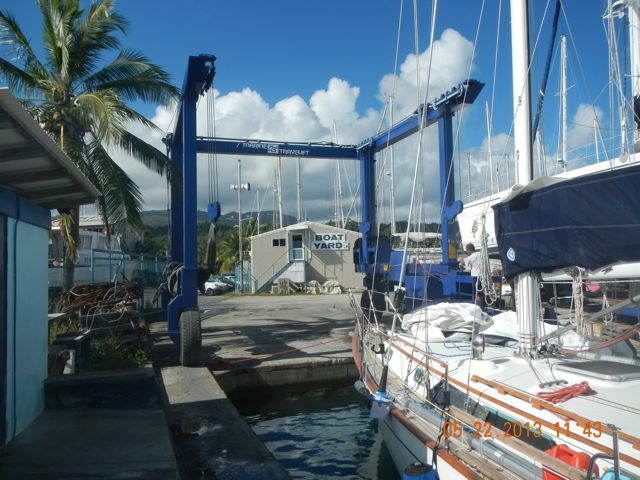 To get her on the TraveLift, we had to disconnect her forestay and use all of our spare halyards to support her mast. Yikes! 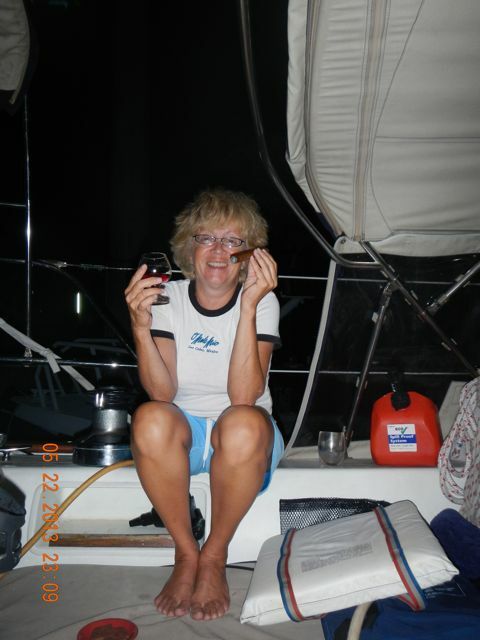 Conni celebrates the last night in the South Pacific on this leg with MacAllan Cask Strength Scotch, a Partegas cigar from Cuba, and dark chocolate. She's the queen of celebrations.